This one is a short one my friends from Monterrey, Mexico. The show was a little different tonight on tour with Michael Bublé. We have done about 150 shows over the course of 20 months. And at each show we have successfully walked through the crowd with MB. Not so tonight my people. It’s funny how you can on one hand say; “People are the same where ever you go” and to some extend that is true. But on the other hand; “People are different”… and that was the case tonight. 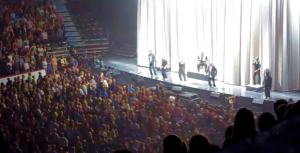 Mr Bublé said “Ladies and Gentlemen, welcome back Naturally 7” and then attempted (as done each night) to go down into the audience and make his way to what we call the “B stage” on the other side of the arena. We followed (as we do each night). But the crowd was too excited. MB only made it to about row 12 before his body guards rushed him back at lightning speed. I stepped down into the audience behind Garfield as I do always, but before I got pass the second row, I was called for a quick photo. I quickly thought; I should be able to do this during a 5 second break of singing. So I went for it. No, no, no… the husband fooled me. He wasn’t ready at all. I was posing with his wife way too long and I knew that I had to get away! Then I noticed that I was being surrounded by more hopeful photo takers and I thought to myself… “Bad move… gotta move… gotta escape”. Before I could even think of a get away strategy, I saw the strangest thing; I saw Marco, who usually is standing by the “B stage” moving wildly in my direction followed by Michael’s personal body guard, Jose. “What in the world!” Jose had that look like “I will knock everyone down if I have to get MB back to the main stage”. And that’s exactly what he did. So my next thought was; “what now?” I decided quickly and joined MB who was now sitting on the edge of the main stage. Hops and Garfield joined too. But the other 4 who go down the other side made it to the “B stage”, but in vain. They now had to get back so that we could do the performance all from the main stage. Again, another big deal as they would tell you. Not easy with a really aggressive audience. Far cry from some places in Europe where the crowd is sometimes afraid to come to close to you… you almost have to have that look like; “no, it’s ok”. This is our 3rd to last show. The people were absolutely beautiful on the signing line tonight. So excited! Which was not what we expected as it was the first Arena that we didn’t get a natural standing-O. I think it might be because it took so long for people to get to their seats. I don’t really know, but we’ll see what happens in Mexico City! Talk to you tomorrow and let you know. This entry was posted in Roundtrips and tagged Crazy Love, Mexico, Michael Bublé, Monterey. Bookmark the permalink. YOU GUYS are over reacting, try to study more about cultural behaves next time you come Mexico (if you ever because after this bad post you are not welcomed here anymore) and be thankfull you are not dieying in Africa instead posting stupidity paranoic things about Mexico. @La Ostia – if you were to at least attempt to try to understand what N´glish was saying here, rather than responding with such venomous disdain for what you ´think´ he said you would realise that the meaning of “aggressive” here meant assertive, bold and energetic. It didn´t necessarily have a negative connotation and N´glish explained this in his follow-up ´Roundtrips´dated 8/20/2011. What was written was, as N´glish puts it: “From my point of view it went like this” – what he was saying, was exactly that. Unless you, yourself, were in the exact same position as he was as the events unfolded you would not be able to fully appreciate the situation the occurred. It is very different from an audience point of view, compared with the view of the artist – this is how N´glish felt at the time – its as simple as that, and he clarified that the Monterrey audience were “aggressive” (assertive, bold, energetic) in a positive way, not in a negative way. Of course, you have every right to express your opinion on the matter, as do I, but there are ways to provide constructive criticism if your views are different. However, posting in the manner in which you have done, you have come across as incredibly racist and without any thought or understanding of the racial stereotype you are placing Naturally 7 in without having done any research into who this group of gentleman are and where they are from. *None* of the members of Naturally 7 were born in Africa, but were born either in England or in the USA. They have obviously worked incredibly hard to get to the position in which they are today – this is the second world tour on which they have supported Michael Bublé, and having attended several of these concerts all over the world I can tell you that they have indeed received a standing ovation at every concert I have been to. So given that the audience reaction in Monterrey was of deafening applause, cheering, smiles and general appreciation of the group when they were on stage, it is natural, in many cultures that a standing ovation follows. OMG guys, that makes me so sad and upset. I can remember seeing Michael whenhe could come into the audience and be safe, what a treat. I also remember when it changed to taking a picture with a child near the front, and that changed. I’m happy for his success, but a group of people with that mob mentality… Scary stuff! Now maybe it’s happening with you boys, your popularity and success is growing everyday. If it does, don’t forget us true friends (and family) who will always respect your guys space and time. I’m glad all is alright… but that is some scary stuff right there. I saw Hops’ tweet this morning and wondered what the heck happened. I’m glad you guys are safe. Crazy stuff tho!! I was in the concert lastnight here in Monterrey, I am super fan of Michael Bublé since he was in American Idol, so I didnt had the oportunity before to see him on a stage singing, but i saw many of his videos and know how he usually go down with people in one point of his concerts! But is México, people here are diferent from other places, if we love you to death, we will yell, we will sing and do lots of things to show you we are there for you and pay a ticket because we want you close, and we might want a piece of you, by kissing you and huging you. I was in the front of the side of the stage, so i saw him closely and when he start to walk down i was OMG, you better go back to the stage, this girls will eat you alive, and it happend exactly what I imagine, he had to go back after this girls put their hands all over his body loll, a good advice to MB is not to try to do this in Mexico city concert! Many artist performe in Monterrey, you dont have any idea how fans are with people like U2, Iron Maiden, Rolling Stones, etc, they make the stadiums blow away in this concerts, artist say it after this, concerts in America Latina are the ones they enjoy the most because the people there really get in to the mood and are the best. Anyway, I hope i can go to see MB in some city in USA, to buy a good sit and watch him even closely than lastnight and to really enjoy a diferent mood, in some point i get mad my self with this girls because they didnt lets us enjoy the etire show. So sorry guys, btw you were just awsome lastnight, you are so good with this gifted voices, God bless you all! De acuerdo totalmente contigo !!! Y ni estoy d acuerdo con el comentario de ellos nos ponen como unos salvajes!!! By the way, Michael Buble was never on American Idol – he is a Canadian and was famous before that show was ever around. This was the first time i saw him singing, this is why i said this! Guys! You are great! Consider me a new fan! Thanks for autographing my new CD. I was there last night, and sorry if the people up front scaried you, but it wasn’t in an aggressive way or with a mob mentality. Excitment was going out of hand in some fans. Coldplay did the same thing of walking over aisles and get through it like and sang in their B stage in a stadium concert. One thing is that they expected the frenzy and planned how to get through it, for MB and you it was a total surprise but I hope to see you both back soon. I was seated way back and your sound was beautiful and appreciated on the most. Standing-Os are not the only way to received people’s love, in Monterrey, we may be a tough crowd but feel blessed and love by the caring, appreciating and sales of your CD, pictures taken and screams you received yesterday, since there were plenty. You have impressed us. Be sure of that. Hahaha I wonder if Michael thought “todos estamos muertos” like he did when the lights went out in El Paso. Naturally 7 you all are Tough! Mad talent right there you all got. Hope to see you and Michael soon! Oh my Gosh, Roger…. man! People just love you more and more wherever you go. LOL (But you should’ve gotten a standing o, I mean seriously). Anyway, I probably would’ve attacked you too… WITH HUGS!!! Anyways, I hope you’re doing well. Give my best to the family for me, and I hope to hear from ya soon. Good bless! Hi!! I was at the show last night, and I really liked your performance it was pretty amazing the way you sing and do magic playing your like ‘instruments’. I was pretty upset that MB couldnt make it to the Stage B, I think it would have been the cherry to such an amazing show (you make a great team), anyhow I dont think fans meant to hurt you, I guess it was due to excitement and adrenaline. Hope you guys come back to Mexico soon and I wish you the best of luck on whats left of the tour! P.S Beside the “incident” did you enjoyed giving a show on Monterrey last night or was that just a bittersweet experience (just curious)? Guys you were totally amazing!!! I loved every second of it…. NEhow.. you were great yesterday evening… and lots of REGIOS will be checking you guys out from this day forward!…. And we will never forget the way MB looked yesterday!!! There are nothing else, but nice and lovely comments about yesterday’s show! So… CONGRATS!!!! and God Bless ya!! I am so glad you guys are okay. I can’t imagine how that must of felt. I guess some folks just get caught up in the excitement of meeting someone who is larger then life. I have felt nervous around you guys but never been too excited to control myself and act properly. You guys are always gracious and caring when approached so I always feel quite comfortable around all of you. I know I have been tongued tied around MB and felt a little standoffish when I have been face to face with him but never to the point of OMG I gotta tear his suit apart. I don’t understand that way of thinking but the crowd and the excitement sometimes takes a hold of people. I am glad you all are okay and MB made it safely back to the stage. Be safe and God Bless guys. Hi! I was at the concert in Monterrey, seated in the back of the arena. I was so happy to have gone there, because I have been a huge fan of Michal Bubble from a long time ago, and that is not only for his style, charm, looks and voice, but also because he has covered songs that I have always liked. Basically, I know all of the songs that he sings. I liked your performance too, Naturally 7, although I didn’t know you before. You are really gifted and talented. Naturally, I was happy and telling everybody today about that great concert. Now, I fell SO SAD to read that you say us “Not easy with a really aggressive audience”. WOW, that really hurts. I feel offended. I wasn´t of the ones that stood up, I was actually very away, so, I’m not justifying their actions, but, to call them aggressive is way too much. Were they trying to hit you and harm you, or were they just trying to touch you, hug you, etc. ? I know it was wrong and I understand you felt in danger somehow, but I think that, as performers, you should reserve those opinions to yourself. You are classifying a whole crowd of thousands of people just because the ones in the front wanted to touch you. About the standing ovation, well, I think is a matter of culture. But, didn’t you hear the yelling, the clapping, the attitude of the audience towards your performance? Even though like three times it appeared that you were over and MB was gonna come, and then you sang one more, people were always happy and celebrated all of your songs…and many of us didn´t know about you before. Lety, totally agree with you 100% They were never with agressive people, we are not lilke that, is incredible how ignorant of some cultures some people are sometimes! Yes hurry home because you all are not welcomed in Mexico, NEWBIES! I feel it is a bit presumptuous to expect a standing ovation when you are in a non-english speaking country and are virtually unknown. I don’t mean to say that you guys are not talented, don’t get me wrong. The show was great but the people at the arena where there to see Michael Bublé and him only. Opening acts are not common in Mexico since most singers prefer to have the audience’s attention all to themselves so, to me, it’s perfectly normal that people chose to look for their seats at the last minute before MB took the stage. Mexican people are very passionate and affectionate (NOT aggressive), we express our admiration in a different way than people of other countries do. The “incident” you got scared with was just MB’s fans trying to get close to him and touch him, nothing more and nothing less. Be aware that if you attempt to get to stage B in Mexico City the exact same thing will happen so if you didn’t like it the first time just omit that portion of the show tomorrow and sunday. I traveled to MTY yesterday just for this show …. I found incredibly talented and wonderful … but it’s somewhat rude to an audience that greeted with such enthusiasm, calling them “aggressive” displays of affection were euphoric, but were in no way aggressive, I was there and I never saw who would attack them, that’s why I feel offended by the speech of the public, it’s possible that these comments could keep them for yourself, because as they say no one knew before coming … but yet I can say that I liked and I hope you come soon to stand alone as they are good. Enjoy your stay! And welcome … lucky! I am glad you enjoyed the concert, we had a wonderful time in Monterrey. I am sorry if I said a few things that offended you, but I think that you may be misinterpreting. Nevertheless I apologize and I want to explain just in case someone else is thinking the same as you. “Aggressive” wasn’t used as a negative, but as a way of saying super excited and active. Now looking back at what I wrote: first description is “too excited”. That only meant that there was no way for us to get down to the other side. Is that a bad thing? I think not………in fact, I enjoyed it and I believe MB said to the audience that he liked it too. But like me, he also said that he had done this b stage move in 48 countries and this was the first time we couldn’t get to the other side. I know that may sound like a negative, but in reality it is very positive. Why do I say that? Notice I mentioned that in some places the audience is so passive that they are not visibly excited at all! They say they are but they don’t look like it. Which would any normal artist prefer? Obviously the type of audience that shows it which is what happened in Monterrey. I never said anyone was violent or even tried to touch me, but my other band members struggled to get back to the stage. “Struggled” again sounds like a bad word, but it just means that the audience was feeling good! Last I would say that the most important thing I said about Monterrey was that the people were absolutely “beautiful”. Oh, one more thing………in a very big Arena, because we wear in-ear monitors to be able to hear ourselves, we often do not hear yelling. We get most of our visual clues and cues (feedback) from the front of the arena. This has given us the wrong impression time and time again. So we are always thankful to actually talk to people after the show. Again, I apologize for anything that offended you. We honestly enjoyed ourselves and had a great night in Monterrey and look forward to coming back!. Even if the reply was not directed to me I want to thank you for taking the time to reply and clarify a misunderstanding that was obviously caused by the language barrier that divides us. Your show was very impressive (I still can’t figure out how the guy who “plays” the electric guitar does that with his mouth…it’s jaw-dropping). I hope you take away a good impression of us mexicans and our country when this tour is over. Keep in mind that, as I am sure you know, things differ between cultures therefore unexpected things might occur. Enjoy your last two presentations and, if you get the chance, visit some sites in Mexico City…it’s to die for! (some recommendations are Castillo de Chapultepec, Zocalo and Museum of Natural History) and enjoy some of our cuisine! Mexico City is just about the best place to get pretty much anything your heart desires. Have a lovely trip back home! i guess your explanation is for all the people in Monterrey not only for Leti, anyway, I am glad you guys enjoy the audience even if you freak out a little bit! BTW, just saw this video of you guys, i really think you are amazing! http://www.youtube.com/watch?v=kIncyfE9_eg for all of you who want to watch it! Good luck in México, city! http://www.youtube.com/watch?v=rCWDRQdh_xQ&NR=1 i guess i had a mistake by submit the other one! here it goes again! You black people never come Mexico again, you are over reacting about it. Nobody wanted to hurt MB or you (Who the F**** are you by the way?) I won´t ever will go to watch your show when you came back to Mexico alone. If you consider Mexican people wants to hurt you then f****** leave. We all want to see MB , not some paranoic blacks! They are wonderful! We hope that very soon we have them here … thank you very much for the clarification and hope to continue to enjoy your stay. Oh wow! I can’t believe what I am reading…I didn’t think the word “agressive” was offensive, I think it definitely explains what happened that night, the fans were crazy, as if Michael was some sort of idol you need to touch in order to be blessed or something. I have been to many other concerts (different artists) in the USA and the crowd is always so respectful, I hate going to concerts here in Mexico, the crowd totally loses their mind over whoever is performing…if you don’t like to be called that way…then by all means…STOP ACTING LIKE IT!!!! I absolutely loved your act, it was beyond amazing, I’d go as far as to say that it’s the best opening act I’ve seen and the one I have enjoyed the most. I think that besides the fact that people here is very passionate, Michael’s show was super emotional he got people wrapped around his finger from the moment he said hola haha. Anyways I’m glad you enjoyed your time here in Monterrey and regardless of some ignorant and idiotic comments I’ve read around here, you guys are more than welcome around here, a top act always is! I read most comments and then read your response, so there´s not much to say only that it was a great show, unbelievable, charming, unexpected and I think it is a great gesture to take the time to clarify your comments. I have never seen so much contact with the audience, (not many performers do that, not even mexican ones) and not only the B stage move, I mean everything!!! the signing, the hand shaking, the camera move, drinking from a fan’s soda LOL… it was amazing, I was jelous of the people on the front rows. Sorry for the inconvenience but again as you said, it was due to a over excitement. I have to say that this year I went to a lot of concerts in this arena and not even Journey had a full arena. I know it doesn´t compare, but it has been a long time since I´ve seen the Monterrey Arena to it´s fullest. Also, it is a bad behaviour to show up late, I didn´t even know that there was another band performing (wasn’t in the advertising or wasn’t too clear) but please also note that our city and it’s traffic is way too complicated these days and it was a work day. Not an excuse, it happens even on the weekends but I guess it’s something to consider. Please come back soon… by far this has been the best show of the year!!! Hi everyone, I´m from the UK and am sat in my hotel in Mexico City reading everyone´s comments from the Mexico shows. I am a longtime fan of MB and N7 and have been lucky enough to see quite a few shows in different countries. I attended all 3 Mexico shows and can honestly say that the experience was fantastic. However, this is me speaking with a fan´s point of view and not the artist. All of the people I met were beautiful, joyous, excited, friendly and very enthusiastic. The atmosphere at each of the shows was amazing and as always both artists gave their all and really enjoyed themselves. There was one thing for me that was different between the show in Monterrey and the shows in Mexico City. In Mexico City, the security arrangements were very tough…absolutely no cameras, no drinks in the auditorium, bag and body searches and the amount of security personnel – I have never seen so many. In the UK, the security personnel are students and older gentlemen working part time….let´s just say that a more reserved UK crowd generally presents them no problems! LOL In Mexico City, the security personnel were big burly guys who weren´t going to take any messing! I liked to see this though….as it was certainly required. Audiences are only excited….there is no malice intended but the fact is that for an artist….having hundreds or thousands of people rush at you can be a pretty scary feeling and certainly will feel aggressive (even if they do not mean to be) just by nature of the sheer volume of people. The security arrangements in Monterrey were not nearly so comprehensive and I think the venue maybe underestimated the excitement of the fans and therefore the performance at the B stage could not go ahead. I have seen first hand the behaviour of over-excited fans….it is at best inappropriate (touching the artist inappropriately) and at worst dangerous (they could be knocked over/hurt). Monterrey is not the only place – I have seen it happen in the USA and France too and I would certainly use the word aggressive to describe those instances as well. I have read the comments on here and can honestly say that I am shocked at some of them. The racist content of some of them is completely unacceptable…from La Ostia in particular. Letty – I am sorry you were offended by the use of the word agressive….but I hope from my explanation you will understand why N´glish felt the reason to use it….I am just trying to let you know how I saw it and how he and the rest of the artists may have felt. I am sure that I would have felt a bit frightened myself if it had happened to me. As for the comment about the arrogance of expecting a standing-o….I don´t think it was arrogance. I have seen a standing-o happen naturally (see what I did there!) at every show that I have been to and I guess it was just a surprise that it did not happen in Mexico…..especially given the level of excitement of the audience. Perhaps this is a cultural thing….there are differences in countries……a slow handclap is acceptable in one place, whilst in the UK this is seen as the audience getting annoyed……in other places it is seen as anticipation. In the UK a standing-o is generally seen as a very big honour to give to an artist…..in other places, not so. I hope that I have given a balanced point of view and tried to think of both the audience and artists perspective. Sorry about those comments as inappropriate people. Sometimes they say things that really do not want to say but the feelings control. But I must say I was left impressed with the show that took place in Monterrey! You are incredible, and way too talented, and again I apologize for the people who wrote offensive comments to you. But after all the care they enjoyed their gig, I hope and have had a good impression of Monterrey and Mexico, and we hope to see them. ps. I have to admit that I translate this on google hahahaha I hope you guys understand, I am not good in english.